This condo comes with complimentary beach service from March 1 until October 31! "For the Shell of it" is a spacious 1950 sq ft 3 bedroom Beach Colony condo located on the Penthouse level has a magnificent view of Gulf from almost every room. This condo is located on the West corner of the Beach Colony East tower, which gives you a majestic view of the Emerald Coast Shoreline. 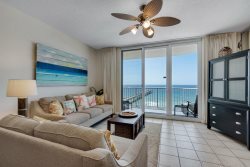 Beach Colony 18D is a penthouse condo with an oversized balcony that allows for plenty of room for all guests. With a fully equipped kitchen, and flat screen TVs in every room, this condo is perfect for 3 couples or 2 families to enjoy with out feeling crowded. Each resident has access to the amazing Beach Colony pool, beach access walkway located on the deck between the two Beach Colony Towers, and covered parking. The penthouse exceeded my expectations. It was beautiful, perfectly located and I WILL book another vacation for this penthouse! I can't say enough positive things about this penthouse. It was a perfect penthouse for our family. Only complaint was wait on elevators. On check in day, it took us about 3 hours to get unloaded into condo because each trip to car was about a 30 minute wait with people in line to use the elevators. Otherwise, this stay was perfect! I can't say enough about your staff !!! They are all awesome. Very professional, caring, fun, efficient. I felt very at ease when talking with them. They handled any and all issues promptly. I have already booked for next winter, and am looking forward to working with them again!!! I love the Beach Colony East ! We have stayed in several other buildings, but this is by far the best. Ricky, BCE maintenance, is phenomenal. We have gotten to know him over the years. He takes such good care of the grounds, etc., and is always so friendly and fun. BCE is lucky to have him! The condo is beautiful, big, and roomy. The views from every room are breathtaking. Overall I felt the team was very helpful. They were kind and gracious when greeting me at check-in, and were helpful when I contacted them regarding checkout. Overall the property was beautiful, all the amenities fit our family well, and there was really nothing else I felt we needed during our stay, with the exception of the extra key as stated above. We definitely loved this property and would pursue staying there again.